HomeNews & ArticlesTrekking Poles: Do They Work? It wasn’t very long ago that anyone seen hiking with two aluminium trekking poles would get asked where they were going skiing. Times have definitely changed for the better. These days trekking poles are standard items in any outdoor retailer. But, do they work? A few years ago I injured my knee. While packing for my next multi-day hike, I dug out an old pair of trekking poles I received as a gift. I didn’t want to hurt my knee again, so I thought I would give them a try. At first they irritated me as I got used to my arms not being in-sync with my legs. However, once it clicked, everything felt easier. My pack felt lighter and my legs didn’t work as hard. Not sure whether or not this was all in my head, I tried to find some information about the scientific efficacy of trekking poles. In 2007, researchers looked at the effects of hiking downhill using trekking poles while carrying external loads. They found that the use of poles helped reduce loading on the joints of the lower extremities. In 2010, academics at Northumbria University conducted a study that showed how trekking poles helped hikers maintain muscle function while significantly reducing soreness in the days following a hike. 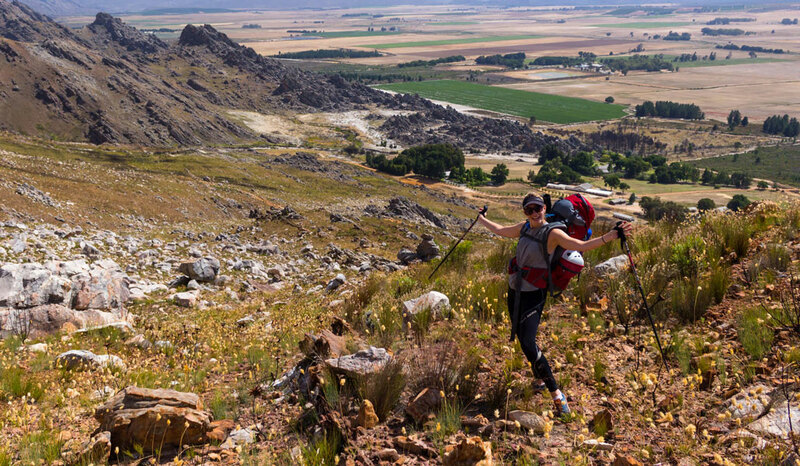 In 2011, another study showed that the use of trekking poles made hiking feel easier and reduced muscle soreness versus hikers who didn’t use trekking poles. My pack feels lighter, so I can pack a few extra luxuries. My legs don’t get as tired. When hiking in the rain, or icy wind, my hands don’t get cold, because my arms are working and circulating blood. Every now and then I have missed a step, or slipped on a rock, and instinctively I stuck out my trekking pole and recovered my balance. 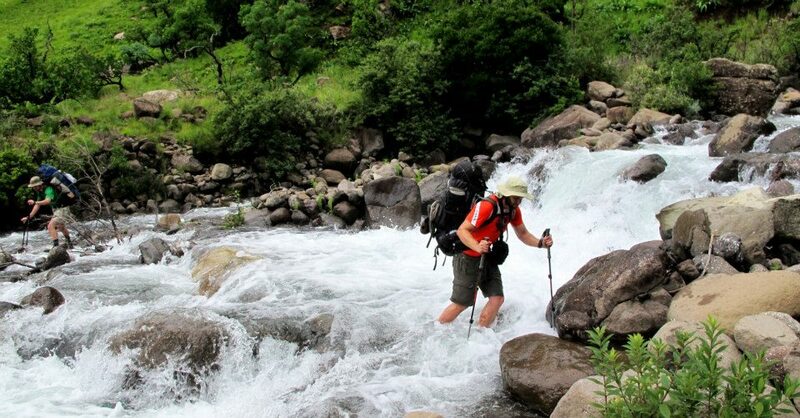 Crossing rivers is much easier with the added stability of trekking poles. 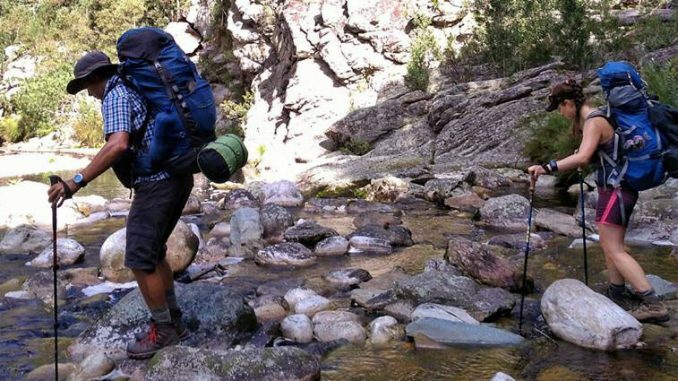 If you’re still not sure about trekking poles, borrow a pair from a friend and use them on a multi-day hike. Once you’ve gotten used to them, stop using them. You will feel the difference immediately. Trekking poles take a bit of getting used but once you are convert can’t do without them. If you are doing any scrambling it is useful to have the attachments on your pack that make them easy to stow and leave your hands free. I was converted while doing the Fish River Canyon except that those without kept borrowing one of my poles for the river crossings. After slipping and sliding my way through one of the trails on the Outeniqua last year I can definitely say that a trekking pole has been quite a handy addition to my gear,since.I went for an entry-level pole at Mr.P Sport (R200) and whilst it might not have all the bells and whistles of a say,Black Diamond,it does it’s job adequately enough – it’s adjustable and has a shock-absorbtion feature. @Don_WC Nothing too dramatic. Once to move a fat Puffy of the Pipe Track (I wasn’t doing the moving though :D) and once to coax a young Berg Adder out of a bush in the Cederberg to take a photo of it. I learnt to use one in Nepal. Used it again last weekend going up greys pass. My arms felt the effects.. 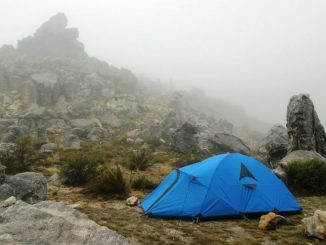 I agree hiking poles are the way to go, i have seen/felt the benefits and feel inadequate if they are not in my hands. I hike faster going up and down hill than my friends who don’t have, as well as feel the benefits the following day when the muscles start stiffening up. I never hike without my hiking poles! I use my hiking poles on all my hikes. Climbed Kili twice and the poles a must, especially uphill and take a lot from your legs. Downhill to stabilize. Climbed a lot in the Drakensberg. Hiking in Kruger Park and Hluhluwe especially helped when raining.